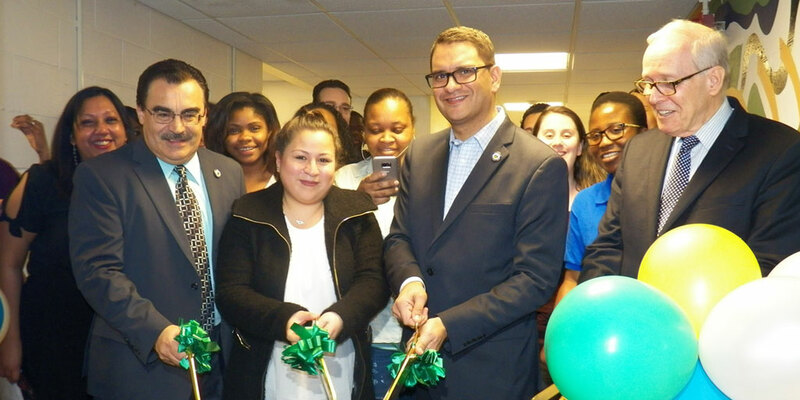 Members of the Lehman community celebrated the opening of the Herbert H. Lehman Food Bank, located in the Student Life Building, with a ribbon-cutting ceremony. (l.-r.) Vice President for Student Affairs Jose Magdaleno; Melissa Chumpitazi of Food Bank of New York City; Lehman College President José Luis Cruz; and Director of Campus Life Michael Sullivan. The Student Life Building—home to various clubs, the radio station, the newspaper, and other student-related organizations—now has a new tenant: the Herbert H. Lehman Food Bank, for students struggling with food insecurity. Members of the Lehman community gathered there for a ribbon-cutting ceremony to inaugurate the opening of the pantry on Wednesday afternoon. 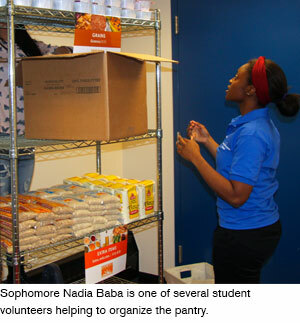 “With this food bank, Lehman College joins a movement taking place at colleges and universities across the nation to address hunger issues among students. With this food bank, Lehman College joins a movement taking place at colleges and universities across the nation to address hunger issues among students. A report published in the fall by the National Student Campaign Against Hunger and Homelessness showed that 22 percent of students are hungry. Nearly 4,000 students from 26 four-year colleges and universities and eight community colleges participated in the study. Forty-eight percent of those surveyed said they experienced food insecurity in the past 30 days. Ramsundar, who also oversees the Herbert H. Lehman Center for Student Leadership Development program, brought the idea to her students. “They worked together to develop an implementation plan using the Social Change Model,” she added. Many leadership students are volunteering their time to help with inventory, packing bags, and spreading news about the new service. Cases of juice and cereal, peanut butter, and applesauce, as well as canned goods like sardines and tuna, and bags of white and brown rice began arriving on the campus a week ago. Shovaine Singh, a Dietetics, Food, and Nutrition major at Lehman, will manage the day-to-day operations of the pantry. She was there on the day of the shipment to unpack the contents and carefully arrange them on the shelf. Her background in nutrition comes in handy, as she mindfully selects items with the highest nutrition value and roots out those with additives and high sodium and sugar levels. Singh is intent on creating a welcoming atmosphere for students. “This is a judgment-free zone,” she explained. “We just want to minimize hunger and malnutrition so that students can go to class and not be stressed about food.” Students who wish to take advantage of the food bank can fill out an online form with a list of the items they would like and then set up a time to pick it up on one of the three days that the pantry will be open. Right now, the College is working with Food Bank New York City and the City University of New York to bring the food program to students at Lehman. In addition, the College will accept donations and student clubs will be encouraged to get involved in fundraising. Indeed, the food bank has already received its first donation from the Sigma Theta Tau International Honor Society in Nursing.